The EKG trail is located in the Klondike Bluffs Area north of Moab, Utah. The trail ripples its way across the west side of the bluffs in a north-south direction, constantly rising and falling like the line on the graph of an EKG. The rise and fall has more to do with riding up the slickrock and then back down it than it does with dropping in and out of valleys. Whoever rated the trail gave it a 'Difficult' rating. We are thinking that they might be referring to the amount of effort it requires more than the level of skill needed for the ride. We thought although it was a strenuous ride it only required intermediate mountain biking skills. All that aside, it was an enjoyable and fun ride. There are 3 different trailheads that you can park at for the EKG trail. At present the Copper Ridge trailhead is the only one with a restroom. The amount of dirt road that you have to drive is shorter for the Copper Ridge and Mega Steps trailheads. They are both around 2 miles off of Highway 191 whereas the Klondike trailhead is 2.7 miles off of the pavement and a little rougher. Normally the EKG trail is combined with 1 or more other trails so the combination you choose might help you decide where to park. For this post we began at the Copper Ridge Dinosaur Trackway and rode the Dino-Flow trail south to its junction with EKG. The EKG trail starts out with a little climb that switchbacks up the hillside. The Miners Loop trail departs to the right at about the 2 tenths point of the EKG trail. From the Miners Loop junction the EKG trail continues across the uneven slickrock working its way to the North Klondike Bluffs area in its serpentine fashion. The trail heads back down the slickrock as it approaches a wash that cuts into the ridge so that it can cross it at its shallowest point. Wash after wash cut into the bluffs giving it the appearance of a comb with broken and half broken teeth. At the 8 tenths of a mile point the EKG trail comes far enough back down the ridge that it actually kisses the Dino-Flow trail and shares its route for about 20-30 feet before climbing back up the hillside. The EKG trail only has a 5% average grade making most of the uphill portions of the trail pretty easy to handle. At the 1.42 mile point EKG crosses the South Baby Steps trail. 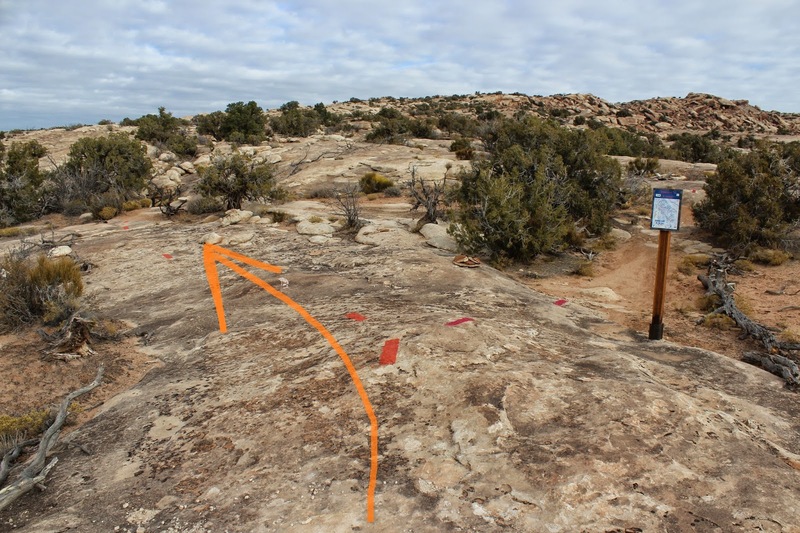 Various outcrops of rock and distant views of the wingate canyons around the Monitor and Merrimac bluffs, towards Canyonlands, create a delightful scene that adds a bit more enjoyment to the trail. EKG crosses the Little Salty trail at the 3.13 mile point. There are a few dirt sections of trail but a person probably wouldn't have to dig very far before hitting rock. At the 4.47 mile point EKG crosses the North Baby Steps trail. 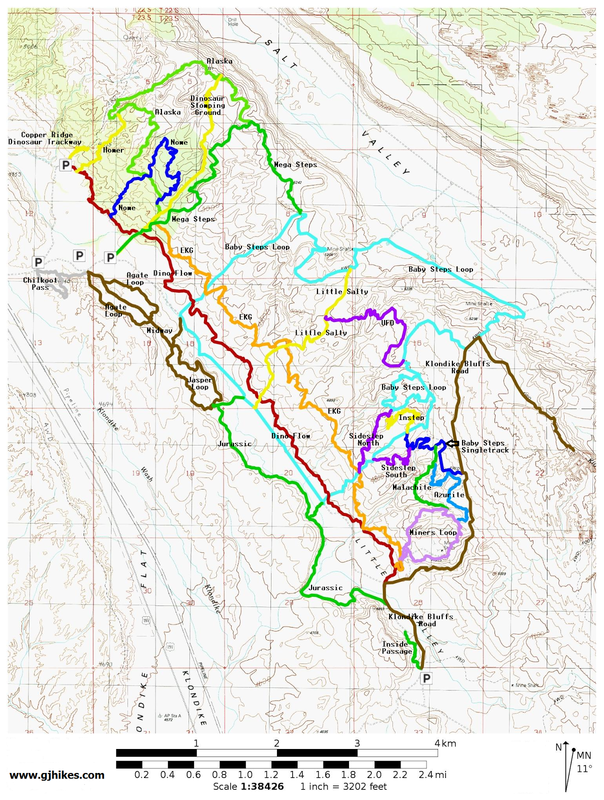 The North Baby Steps, South Baby Steps, Klondike Road and Copper Ridge Road all combine to make the longest trail in the area called the Baby Steps Loop. After 5 1/2 miles of crawling up and down the bluff the EKG trail comes to an end at its junction with the Mega Steps trail. For this post we were parked at the Copper Ridge Dinosaur Trackway trailhead. We had rode the Dino-Flow trail from there to its junction with the EKG trail. From there we rode the EKG trail to Mega Steps and took that back down to the Dino-Flow trail and back to the trailhead. The entire loop came out to 12 miles. With all of the trails that intersect the EKG trail there are a lot of route combinations that can be put together to please just about anyones need. If you would like to see it for yourself then all you have to do is grab your bike or 'Take a hike'.